In downtown Skagway you’ll find mainly souvenir shops as well as a few restaurants and bars. The most famous bar in Skagway is the Red Onion saloon. This was a place for men back in the days of the gold rush, it’s possible to take a tour of the upstairs area of this saloon too. You can also enjoy a drink and meal whilst being served by girls typical of the gold rush era. A short walk from downtown you’ll find Klondike gold dredge which has lots of information on life here during the gold rush. 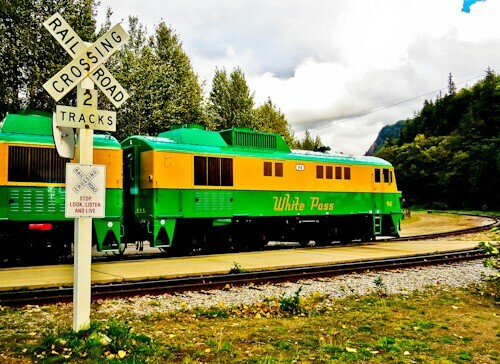 In 1898 during the Klondike rush, the railway was built, which climbs 900 meters in 30 kms from downtown Skagway to the white pass, Yukon. This railway is often referred to as the railway built on gold. Now, it’s used as a tourist attraction, tourists enjoy the amazing views during the ascent. Seats on the train sell out quickly so I recommend reserving in advance. The Chilkoot pass is known as ‘the worlds longest museum’ or the ‘meanest 33 miles of history’, it’s the hiking equivalent to the railway. Remember, the gold rush started before the railway was built. You’ll need to organize a walking permit and be familiar with bear safety before taking this route from Skagway to the Canadian border. 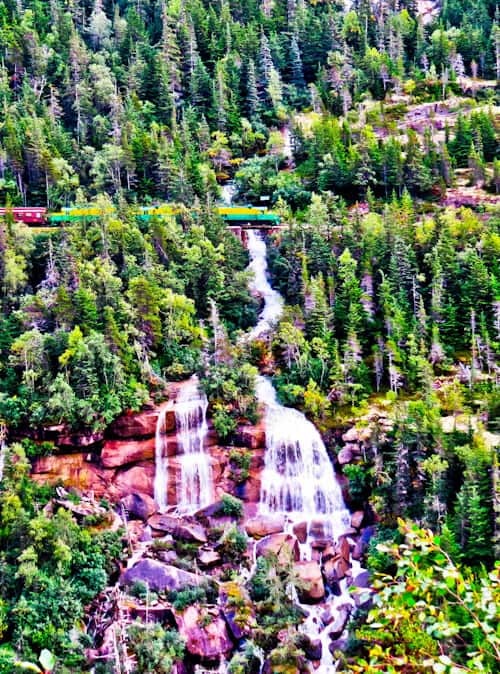 As I prefer to take the bus over the train, I got to see Pitchfork Falls from a viewpoint on the road that winds around a similar route to the train. As you can see from the image above, the train track is on top of the pitch fork. At over 600 meters in height, Pitchfork falls are one of the highest falls in the world. The white pass itself is very beautiful. Do you think the guys who took this route during the gold rush took the time to appreciate the views like the people of today do? It’s the views, the history and construction of this railway that make the Yukon pass the most popular land excursion in Alaska. The full route is over 175 km long, winding around mountains over the Yukon pass and has been awarded the international historic civil engineering landmark. Tourists get to experience over 100 km of the original route. 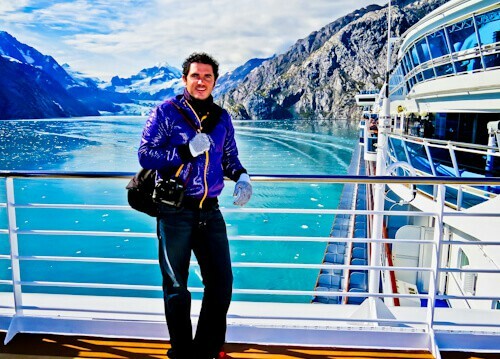 From Skagway I continued my Princess cruise to the highlight of the Alaska trip, Glacier Bay National Park. On the cruise ship I again enjoyed unlimited food, lots of great entertainment and I managed to do some exercise in the gym. The Alaskan Gold Rush was such an interesting period of history. Touring the old saloons would be so fascinating! The scenery looks beautiful! Reading your post has made me want to learn more about the Alaskan Gold Rush now, which is something I’d never heard of before. The photo of Downtown reminds of Wild West films! When I think about that area, I always just think beautiful views, but I love that there is so much history there too. I would love to travel this route – Alaska has been on my bucket list for a long time, and I hope to be able to travel there soon. I’ve been to a few places in Alaska — Juneau, Ketchikan, and Sitka — but never Skagway. We also went on a cruise to Alaska, but with Celebrity instead of Princess. Your photos make me want to return and explore it on my own! So cool! You’re creating a great destination in my mind! 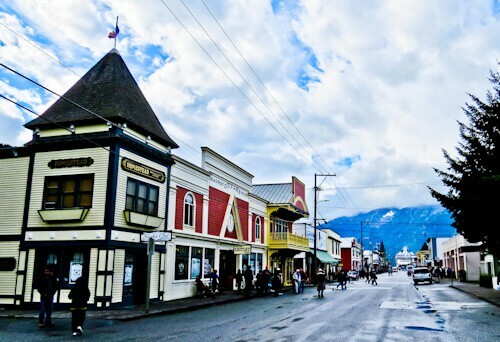 Skagway looks so amazing and full of history. I love the history ofthe gold rush and the fact that the gurls in the red onion saloon srill dress like they did back then. Also love the shot of the falls. 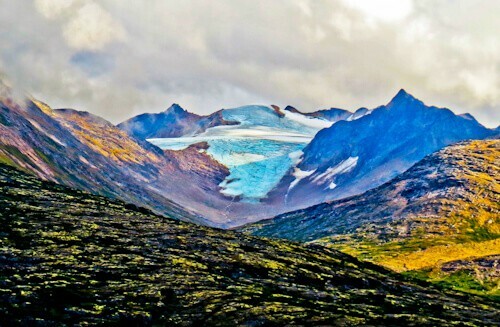 Alaska is on my list of places to travel for sure. Nice overview. I really can’t wait to go there myself and see it! I love your picture of downtown Skagway, it looks like a fun town to walk around in with the view of the mountains right there too! What was your favorite piece of scenery on the trip?